We join proceedings a little way in as it took a few moments to find a good vantage point and find an acceptable camera exposure level. Thankfully, we have already passed the bit where I humiliate myself in front of 22 Brazilian soccer players by tripping on my laces when trying to kick back their stray football. I first noticed the bird as it flew up from the ground and into the tree. I could not easily identify it straight away and needed to get a better look. 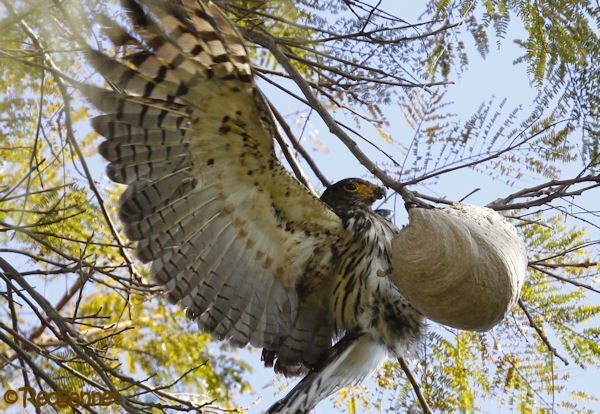 It landed immediately above a bell-shaped wasps’ nest (now, it could have been a bees’ nest. 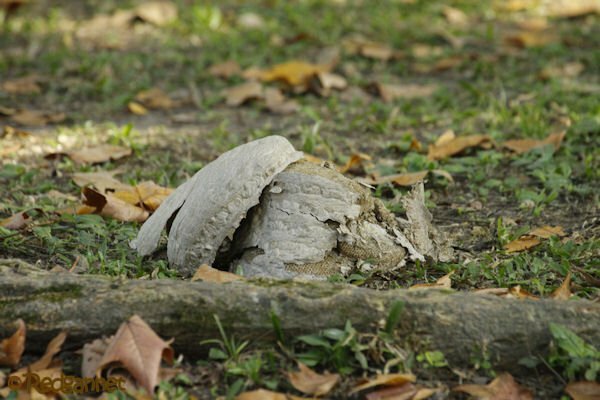 I will happily take advice on that, but until then I shall describe it as a wasps’ nest). The wasps were aware of the threat and came out to defend their nest. I watched this through the binoculars from a poor angle before finding a gap for a much better view. The wasps concentrated their attack around the bird’s head focusing on the bare skin of the face and around the eye. The face appears to be moist which could come from honey perhaps? It might also have been eating something else on the ground before it flew up. 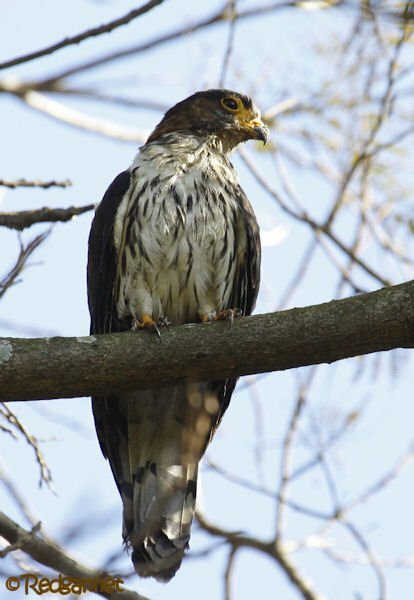 The Gray-headed Kite is usually known for waiting on high perches rather than skulking behind the goal posts at a Sunday soccer match. 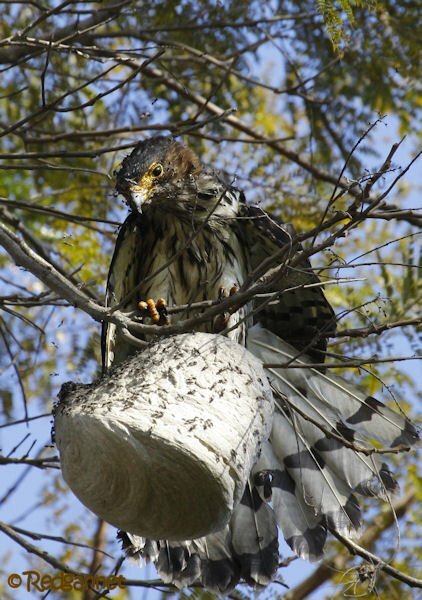 The bird scraped at its face which must have taken many stings, but eventually most of the wasps gave up and abandoned the nest. This left the young kite free to rip into it and chunks of protective outer layers showered down as the bird opened up the combs inside. I was unsure if the extended wings were to keep the prize from view, a technique known as “mantling”. It looked more as if the bird was trying to steady itself on a very unstable perch. 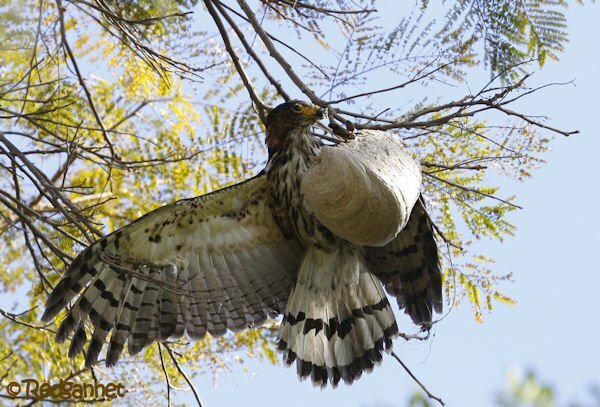 Eventually the structure of the nest was so badly damaged that it fell from the tree and crashed at my feet. 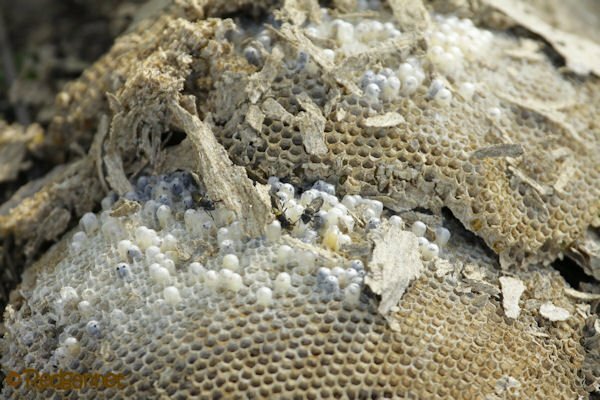 I still find the insides of insect nests to be quite astonishing in their construction. The inside appeared to be very dry with no evidence of any honey. There were grubs however and a few die-hard minders that had gone down with the nest. I withdrew in case the kite came down to finish it off. They will eat grubs and I assume that this was what it had found in the nest. It didn’t come down to see what was left. Instead, it preened for a few moments before flying off to a much denser perch to sit out the heat of the day and to recover from its stings. The sighting lasted for about 30 minutes and a number of flicks through my guide book left me unsure about the identification. A juvenile Gray-headed Kite appeared to be the best fit and I tentatively recorded that. It was only when I returned to Wi-Fi land that I was able to confirm it. Well, isn’t that some interesting behavior. 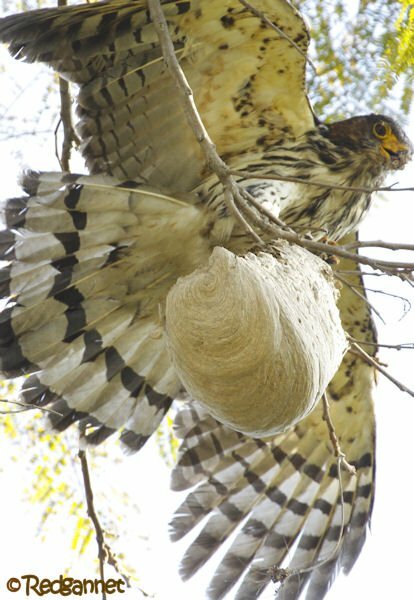 Who would have thought that a bird of any kind could take that many stings, with no apparent effect, and how hungry does it need to be? It would be interesting to see if there was any trauma for the bird later. 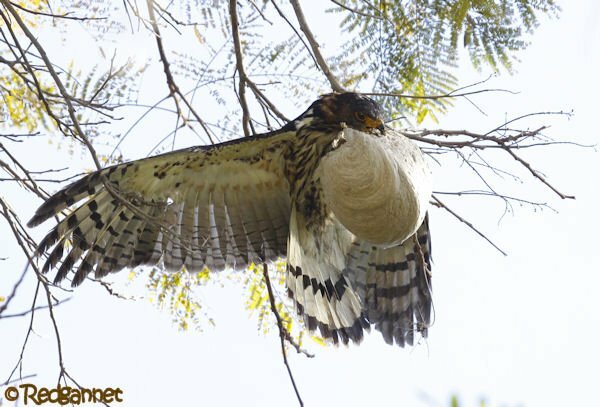 What a cool sighting, perhaps a learning experience for the young kite. 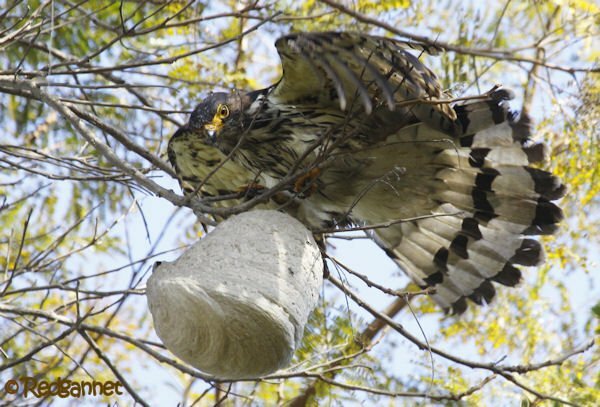 Over here in the UK we have the Honey Buzzard, which is also a specialist in wasp and bee nests. 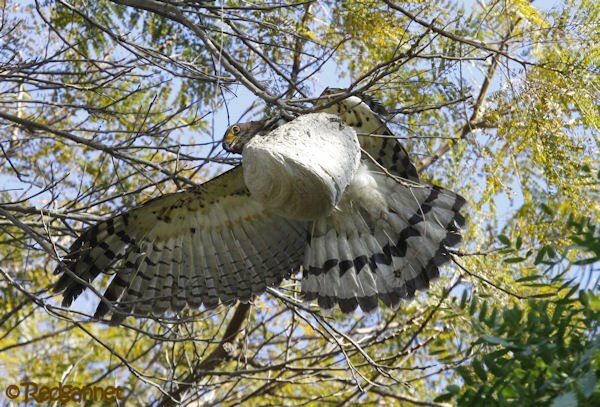 In Europe Honey Buzzards are migrants that winter in Africa. Are Gray-headed Kites similarly migrants?